We offer Pet Food (Regular and Prescription) at low,low prices. All you have to do is order your pet's food on our site and then pick it up at the designated pick up point from 5-10 days later. Note: Hills Science Diet and Prescription Diet products are delivered once weekly on Friday (with a cut-off ordering time of Wednesday noon) hence the variation in pick up time from 2-10 days. Purina Products are ready for pick up within three business days. Order now, pick up later and get the lowest price and convenience possible in getting your pet's food. 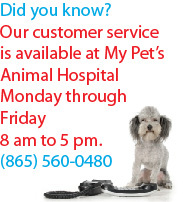 Call us at (865) 560-0480 at My Pet's Animal Hospital if you have any questions!